Inspiring Art Teachers to Explore Art History | Curator’s Corner: Temple on Active Volcano’s Slopes! Temple on Active Volcano’s Slopes! 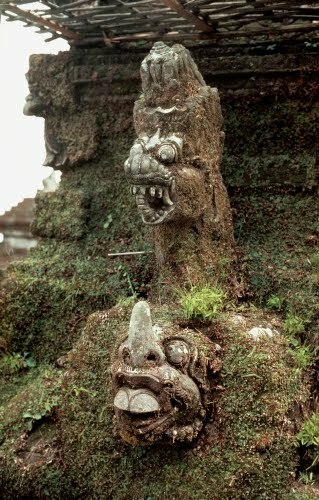 I’m naturally concerned for Pura Besakih (Mother Temple). It is situated on the slopes of Mount Agung, which is currently causing havoc with its eruption in Bali. It survived a major eruption of the volcano in 1963, when the lava miraculously parted and flowed around the temple. It would truly be tragic if anything happens to this treasure. That would also include ignorant, disrespectful tourists taking crude selfies, as recently happened Wat Arun in Thailand! Pura Besakih is a complex of twenty-three temples that sit on parallel stepped terraces. 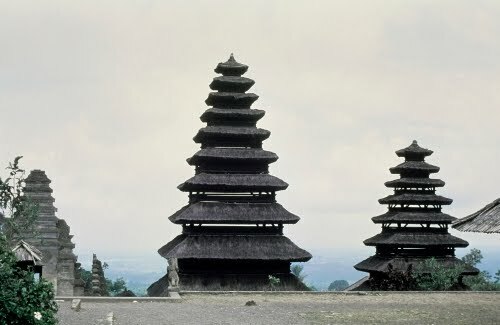 Each of these temples has a “meru,” a tiered, pagoda-like tower that reflects the built-up pyramidal shapes found in Indonesian temples. In both cases, the rising form symbolizes the legendary Mount Meru, a golden mountain that stands in the center of all creation outside of the physical plane. The pura itself is built on the side of Mount Agung, considered a sacred mountain, and the stairs that connect each terrace represent a symbolic ascent of Mount Meru toward the Hindu gods. Besakih temple was originally a terraced temple dedicated to the dragon god Besakih, who is believed to inhabit Mount Agung. 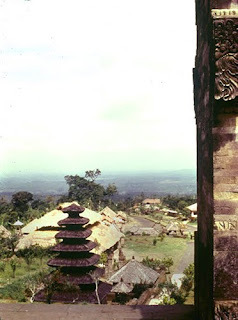 After annexation by the Majapahit rulers in the 1300s, the temple was dedicated to Hindu gods. The merus at Besakih consist of a masonry base about three feet (one meter) in height with a wooden ante-chamber raised on stilts. The ante-chamber is surmounted by a series fiber-thatched roofs in diminishing size. Various relics are buried in parts of each meru to make them acceptable to receive visits by the deities. The number of roofs is always an odd number, related to the god for which the temples are a temporary residence. Eleven tiered-temples such as these are usually dedicated to the highest gods in the Hindu pantheon, such as Siva, Brahma, or Vishnu. “Gargoyles” in the temple precinct served the same function as guardian demons in Buddhist temples, or gargoyles on Christian cathedrals: ward off evil. Fossilized human remains indicate that prehistoric Bali was occupied going back to the Paleolithic era, as early as 248,000 BCE. Cave paintings and jewelry made from animal bones have been found on the island of Sulawesi, northeast of Bali, that date between 38,000 and 20,000 BCE. Bali was occupied by Austronesian migrants sometime between 3500 and 2000 BCE, judging by the existence of stone tools and earthenware vessels near Cekik in west Bali. The Austronesian migration southward toward New Guinea, and ultimately Australia, originated on the mainland of Southeast Asia. Rice, raised in China as far back as 9,000 BCE, extended to Indonesia around 1500 BCE, and possibly to Bali by 900 BCE. Metal artifacts discovered near Cekik indicate that Bali's bronze age had begun by 300 BCE. Bali received Indian and Chinese migrants starting in the 100s CE. Hinduism had begun to spread by the 400s CE, and Buddhism by the 500s. By the 900s, rice cultivation was active in Bali. Bali became a colony of the Majapahit Empire (flourished 1293–1520 CE) in 1343. When that empire declined in the 1400s due to the growth of Islamic kingdoms in Java, there was a large migration to Bali of Javanese artists. The word “pura” originates from the Sanskrit word “puri,” which means “walled city,” “city,” “towered city,” or “palace.” In Balinese architecture, it has come to symbolize a Hindu temple complex. Because so many have been built there, Bali is sometimes called the “Island of a thousand Puras.” Most Balinese temple complexes, like Besakih, were planned in three zones: outer, middle, and inner courtyards, each containing a number of shrines.